Welcome to the freebie library! For now, I am offering these worksheets and templates for free. I may decide to make this page password protected, and give out the password in exchange for your email address - but the worksheets will still be free. In the meantime, if you'd like to sign up, I give away some of my best stuff via email, and you will be notified when a new freebie hits the site. Use the form below to sign up! This freebie is a page taken from the Content Creation Workbook, and is easily the most transformational worksheet from it. 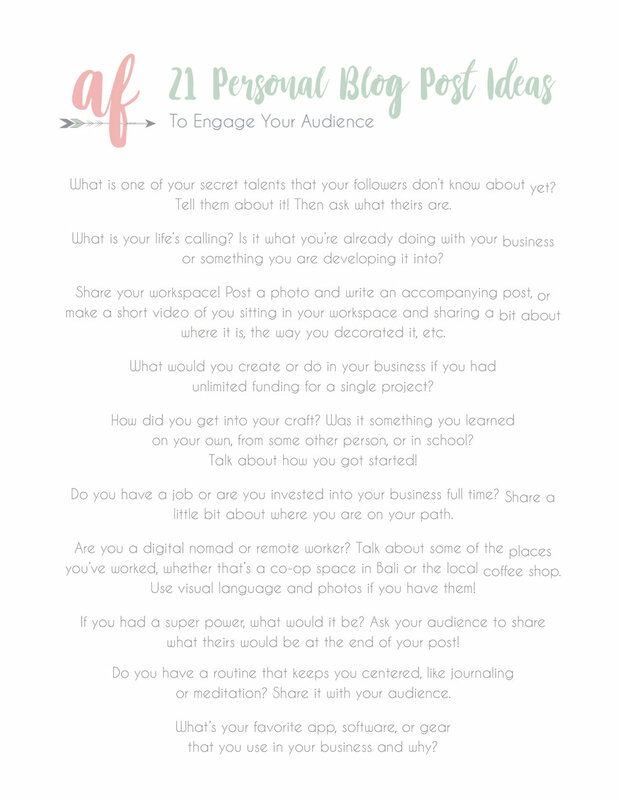 It's just the tip of the iceberg - so much goes into an effective content strategy - but this one page has the power to completely change the way you are showing up online on your blog or your social media. It is designed to take your main topic of your business and break it down into sub-topics that you can post about, widening the possibilities of what you can write about while still providing content that's relevant to your business. Click the button below to get the worksheet delivered to your inbox! Vulnerability is one of the best ways to build your following on your blog and social media. Your audience wants to know who you are, flaws and all! The 21 Personal Blog Post Ideas freebie contains 21 ideas of topics to write about so that you can share your true self with your tribe. The 21 Personal Blog Post Ideas This freebie is offered with the Content Creation Workbook, as a companion item for the exercises on writing awesome AF blog posts. Click the button below to download via The Abundant Freelancer Google Drive. A blog's title is often the one thing that determines whether or not the post will be read. There is an art to crafting the perfect blog title to drive engagement on your post - but it is an art that can be learned. The Awesome AF Blog Titles Template contains over 50 blog title templates and tons of buzz words to use when crafting your titles. This freebie is offered with the Content Creation Workbook, as a companion item for the exercises on writing awesome AF blog posts. Click the button below to download via The Abundant Freelancer Google Drive. The Menu Planner is something I created for myself so that I could remember what meals I bought ingredients for at the grocery store. I can't tell you how many times I have wasted produce because I forgot what I even wanted to cook with it, or because I wasn't in the mood to think about dinner. It sucked to be wasting that food, and, of course - all that money. This month (August 2018), I have set the intention to live more abundantly within the budget I already have, so that I may allow more abundance to flow into my life. When you show your subconscious that you are responsible with money, more money finds its way to you. I wanted to share this template with you, in case you've got the same bad habits as me regarding meal planning. Oh, and if you've got any tasty vegetarian recipes, please email me @ nikkik@theabundantfreelancer.com. I am always looking to add to my recipe book. Click the button below to download via The Abundant Freelancer Google Drive, and enjoy! If you found any of these freebies helpful, you will find immense value in my Content Creation Workbook. Included with the purchase is access to the closed coaching group on Facebook, where you can share your progress and ideas while getting direct coaching from me, plus two companion items found on this page and a free custom font. The Content Creation Workbook is an interactive guide to help passionate solopreneurs, freelancers, creatives, and startups create their own complete content strategy for their blog or social media that will keep the content flowing for months to come. If you're tired of trying to figure out what to post on your blog and/or social media day in and day out, this workbook will guide you through a tried and true process for opening the floodgates of your inspiration. In The Content Creation Workbook, you will uncover untapped topics for you to post about in your niche and brainstorm ideas for each topic so that you will never run out of valuable content to post! · How to use the Workbook if all you’ve got is a social media platform and no desire to create a blog! The Content Creation Workbook is versatile and can be used whether you’re a blogger or social media lover.